"Infographic thinking." This isn’t just "how to make some numbers and vector graphics look clever together." It’s a narrative language--it’s "representation plus interpretation to develop an idea,"
Teaching with Infographics: A Student Project Model - The ten worst man-made disasters in U.S. history a good model to use for other topics also. Give students data related to a concept they are learning and have them practice determining what is the most important point of the data. What is the data telling you? What would be the main question it is answering? Select an easy tool that they already use the first time they are asked to create an infographic. Remember the tool doesn’t matter, it is the learning and with infographics it just needs to be a tool that allows students to create a graphical representation using images and text. Start with a tool they know, then branch out. Critique: don’t forget to have students critique infographics from the web and their peers. What makes the great ones great? What could be added or modified with ones that are hard to follow? Teaching students to critique respectfully allows everyone to improve their craft. Google Public Data - Filter and animate data sets from around the world. The Eviction Lab It’s an interactive map that can give you a detailed report (even by Census Tract!) about history of evictions taking place in what looks like any community in the U.S.You can also read more about it in this New York Times article, In 83 Million Eviction Records, a Sweeping and Intimate New Look at Housing in America.It will be an indispensable tool for any class that is analyzing/comparing neighborhoods. A Lesson Highlighting Community Assets — Not Deficits. Knoema – a service that offers a huge collection of data sets and maps for public use. video overview Recently, Knoema introduced a Chrome extension called World Data Finder. World Data Finder will correlate information from Knoema's data sets and maps to articles that you read online. Statistics in Schools program for K-12 teachers and students from the US Census Bureau. Using current and historical data, the Census Bureau provides teachers the tools to help students understand statistical concepts and improve their data analysis skills. The program offers free online activities and other resources in geography, history, and sociology. The GTG Visualization Tool is an interactive global data mapping of hundreds of organizations that support the education, health, well-being, and success of young women and girls globally. Users can select a country or service area and see a list of organizations serving that geographic location, as well as the services they provide and their websites. Currently, the Visualization Tool includes information for 286 organizations. Find the GTG Collaborative Visualization Tool here. Patchwork Nation makes open data easy. It delivers national data with local context while remaining visually intuitive for the reader. The interactive map helps break down national data to analyze how it impacts communities. We put data in the hands of the user, allowing him or her to compare different data sets and explore national data county-by-county. Zip Lookup The map allows you to enter any US zip code to discover demographic data about that area. Maps & Data section of the U.S. Census Bureau's website is a good place to find that data in a visual format. In the Maps & Data section of the U.S. Census Bureau's website you can explore thematic maps about the population of the United States. possible causes of changes in population profiles over time. World Data Finder – is a one-click assistant for a fast data discovery and data analysis. Gapminder - Displays time series of development statistics for all countries. Munterbund - Graphical visualization of text similarities in essays. What INFOGRAPHIC EXEMPLARS can you find and recommend? Work with a partner or small group to explore the infographic sites and examples below. Look at the examples and identify what you like/don't like about each one. What is the infographic about? What story is being told? How do the words support or distract from the message? Make notes about what you notice and like/don't like about the infographics. Your students will be creating some throughout the year and these notes will remind you of what you visually like to see and will serve as a starting point for you. 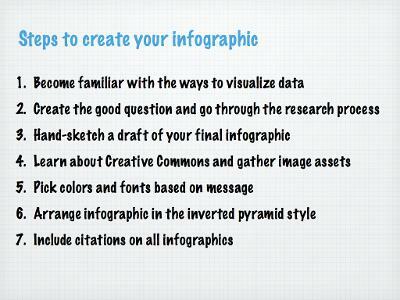 Creating Infographics Screencast Tutorial Easel.ly, where you can use one of their templates to create your infographic. sThe tutorial steps you through changing objects, object size and color, and adding text. Then the tutorial switches to Infogr.am, reviewed here, and shows how to either use their templates, or create your own, including importing your own data and images. Block Posters is a web-based tool to which you can upload a high quality graphic then divide it into letter-sized chunks for printing. Print out each section and put them together on a poster board to make your own poster. Infographics that could be great posters to hang in a classroom if only there was an easy way to print them poster-sized. Most teachers don't have ready access to printers that can handle poster-sized paper, but do have access to standard letter-size printers. Ask students to redesign an existing infographic. That gives them access to all of the data, but allows them to experiment with new layouts, colors and types of charts that are different than what was used in the original design. Then students should be able to incorporate their own original data visualizations into their own reports, presentations or infographics. I’ve seen successful student assignments that ask students to design persuasive infographics about a specific topic covered in class. This requires the students to attempt to clearly show the data that supports a particular position in an attempt to convince the audience. Which Type of Infographic Should You Use? “What’s Going On in This Graph?” The feature will utilize The Times’s rich trove of graphic visualizations—graphs, maps, and charts. Starting on September 19, 2017, and thereafter on the second Tuesday of every month from October to May, The Learning Network will publish a Times graphic on a topic suitable for subjects across the curriculum. The content and statistical concepts will be appropriate for most students in grades 7–12. What’s Going On in this Graph? The feature utilizes The Times rich trove of graphic visualizations. On the second Tuesday of every month from October to Ma, The Learning Network will publish a Times graphic on a topic suitable for subjects across the curriiculum. The statistical concepts will be appropriate for most students in grades 7 - 12. NASA's Jet Propulsion Laboratory website contains a large library of infographics that you can download and print for free. The library contains infographics about spacecraft, exploration missions, planets, moons, the solar system, and comets. If printed in color, these infographics could make a nice addition to your classroom walls. More importantly these infographics could provide a model for your students to follow as they create their own infographics about topics in space science. NASA JPL not only provides a library of infographics, it provides tools for students to make their own infographics. iVisual Info Touch is an iPad app that you can use to create relatively simple infographics. The app makes it easy to create your infographics. It is not necessary to create an account in order to use iVisual Info Touch. To get started just open the app and select a background for your infographic. iVisual Info Touch is available in a free version and in a paid version ($2.99). The paid version includes more clip art, more backgrounds, and allows you to import and insert your own images. Better World Flux is a free data visualization development tool that was created for the World Bank's Apps for Development Challenge. The purpose of the challenge was to encourage app developers to create products that could be used to highlight the development data hosted by the World Bank. Better World Flux allows users to create animated visualizations of development data. To use Better World Flux (no registration required) all you have to do is select a data set from the menu provided and select a country or countries from the menu provided. From there Better World Flux creates an animated data visualization for you. The visualization will change as the years on the timeline at the bottom of the visualization change. This way users can see growth and recession of a statistic over time. Visme. Visme is referring to itself as the "Swiss Army Knife for Visual Content." On Visme you can slideshows, banner graphics, and interactive info graphics including musical infographics . Graphs are animated! Your Visme creations can be shared online by embedding them into websites or blogs. You can also download your creations as image, PDF, or HTML5 files. The US Census Bureau conducts a wide range of surveys and research that spans far beyond the tallying of people and their basic demographics. With a newly redesigned website, the bureau makes it easy for users to find information they need and highlights a number of useful tools and visualizations. For example, in addition to basic data on enrollment and attainment, the education page has data from several surveys compiled into an infographic, “Education Funding: Where Do Schools Get Their Money? How Do They Spend It?” The site also shines with its selection of interactive tools and databases, ranging from simple games such asPopulation Bracketology, which asks users to choose which cities have more people, to vivid tools such asCensus Explorer, which lets users s can the country block by block and view color-coded data on age, education, income and more. Census.gov serves both as a reference tool for students and as a source of fascinating, interactive data ripe for use in classrooms. Canva is a service that makes it easy to create beautiful slides, flyers, posters, infographics, and photo collages. Creating these graphics on Canva is a drag-and-drop process. Canva offers a huge library of clip art and photographs to use in your designs. You can also upload your own images to use in your graphics. Your completed Canva projects can be downloaded as PDF and PNG files. You can also simply link to your online graphic. StatPlanet This one here allows users to create map visualisations and share them with others. It can be used either within a browser or download the software. StatWorld contains more than 400 world maps of data on topics in economics, education, health, environment, the digital divide, and much more. You can explore the maps by selecting a data set and then a display format. You can also choose to display the data for all countries or only the countries that you wish to compare. Applications for Education StatWorld could be a good tool to have students use to compare the economic development of countries and regions. Have students compare data sets from multiple categories and ask them to try to develop cause and effect relationships between the data sets. For example, can they find a connection between the duration of compulsory education and GDP per capita? Icon Archive Search through more than 297000 free icons. Browse icon sets by category, artist, popularity, date. The Noun Project is a great collection of clipart of universal icons. Venngage is a new site that is ideal for creating infographics. • Hohli is an easy-to-use free online application that lets you create venn diagrams in just a few seconds. Google Fusion Tables - A spreadsheet application that makes it easy to create visualizations of data sets. At a basic level it can be used to visualize existing data sets with one click. At a deeper level, you can compare your own data sets and create visualizations of those comparisons. The types of visualizations include tables, maps, charts and graphs. Map a List a tool to turn Google Spreadsheet into Google Maps placemarks. To create a map from your spreasheet you need to register for a Mapa a List account and give it access to your Google Docs account. Map a list walks you through each step. Within Google spreadsheets there are many gadgets that can be used to create cisualization of data. To explore the gadgets , go to the "Insert" drop-down menu then select gadgets. Spreadsheet Mapper Google Spreadsheet script that will allow you to create KML files based on your spreadsheet data. 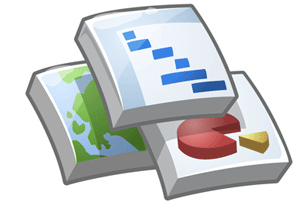 Spreadsheet Mapper 3 allows you to map up to 1,000 placemarks based on your spreadsheet data. And because Spreadsheet Mapper 3 is a part of Google Docs you can share your spreadsheets and maps for collaborative editing. Click here for complete directions on how to use Spreadsheet Mapper 3. Touchgraph Visualize spreadsheets in a graphic organizer format. Upload a spreadsheet and this application will transform into a graphic organizer to help see interrelationships. ChartsBin create mapped data visualizations. It's also a place to find data visualizations created and shared by others. The gallery of data visualizations include categories for education data, environmental data, and lots of economic data. All of the visualizations in ChartsBin can be embedded into blog posts and webpages. To create your own visualizations on ChartsBin you do have to provide your own data sets. You can upload data sets that you have stored on your computer. Once your data is uploaded you can customize the visualization of your data. The video offers a short overview of the process (the video does not have sound). Gapminder (Tutorial video ) A tool that allows the user to present a huge amount of world data visually, in moving, interactive graphs. video presention at TED Gapminder has a page for educators on which they can find thematic animations, graphs, quizzes, model lessons, and a PDF guide to using Gapminder. For teachers working in schools with slow Internet connections or very strict filtering, Gapminder has a desktop application that you can download and install for Mac or Windows computers. This video demonstrates Gapminder desktop. Infog.rm Creates rollovers for charts and infographics. Graphmaster - Graph Master is a program is a one-of-a-kind program that allows students to create three different interactive, printable graphs on one screen based on data collected in a survey or poll of their classmates. What makes Graph Master so useful, however, is the fact that after students make their graphs, the program asks them eight multiple choice questions about their graphs using the inputted data. ChartGizmo - an incredible chart builder for any type of data that can be typed or uploaded to this tool. is a nice tool for creating a variety of charts for online display. iCharts - A site for creating an online interactive chart, either from scratch or a spreadsheet. Hohli Online Charts Builder Using the Hohli Online Charts Builder you can create bar graphs, line graphs, pie charts, Venn diagrams, scatter plots, and radar charts. Your chart will be generated as you enter information so that you can see how each piece of information influences the chart. When you're satisfied with your chart just click on it to save it to your computer or to grab the embed code to use on your blog or website. Because the charts update as each new piece of data is added, students will be able to see how each data set they add affects their chart's display. Google Chart Tools Provides several tools for making data more comprehensible. Choose a Graph Find the right chart type for your needs. Then download as Excel or PowerPoint templates and insert your data. Graphviz Website Graphviz is graph visualization software. It has several main graph layout programs with web, interactive graphical interfaces, auxiliary tools, libraries and language bindings. RCL is a great new site where you can create animated/flash based charts. What separates this online tool from others is its simple user interface and it's unique interactive design. Plus, it has a feature to import existing data, so if you have an excel spreadsheet you can easily upload it too. Another great feature is the ability to either export to Flash/PP or your blog/website. Hohli An intuitive, simple online chart maker. It’s incredibly easy to pick your chart type, add some data, vary the sizes and colors and see the finished chart. The finished charts are also very well designed and look great! The Global Economy.com is a nice resource developed for high school and undergraduate students. It provides guides to understanding the economies of individual countries and the global economy in aggregate. It offers a database of articles about the economies of individual countries. You can select any country from the list of more than 200 to find basic economic indicators about that country. The country profiles include not just the data associated with economic indicators, but also explanations of the indicators, and graphs of the data in comparison with other countries. For visual comparisons of economic indicator data There is an easy-to-use comparison tool. On the comparison page you can select a set of data and the countries that you want to compare. The comparison is then shown in the form of a graph. Visuals Engine provides six customizable templates for creating choice boards, story boards, schedules, and achievement charts. To use the Visuals Engine just choose a template then choose images or upload images for each box on your chart. You can type text to accompany each image on your charts. When you've finished editing you can print your chart or save it as a PDF. Google Graphs You can now search for a mathematical function and have an interactive graph generated at the top of your search results. You can zoom in on the graph and explore each function in detail.Similaries to Wolfram Alpha. Historical Infographic Students will use chronological sequencing to demonstrate the relationship between events and developments in different periods and places. MappingWorlds the site offers users a new way to look at the world by resizing countries on the map in relation to a series of global issues. Thematic Mapping Engine provides users with a very simple way to create Google Earth kmz files. Thematic Mapping draws on data provided by the United Nations to create maps depicting all types of development data and environmental science data. Users select a statistical indicator category, select a year or range of years, and the manner in which they would like the data displayed in Google Earth. If you're using a Windows computer you can preview your files before downloading them. UN Stat Planet Map allows you to create useful mapped displays of UN development indicators data. There are ten data categories from which you can choose. Within each category there are further refinements possible. You can customize the map to present sharper contrasts between the data indicators, change the indicator symbols, and alter the map legend. To visual the change in data over time, use the time slider at the bottom of the map. Your maps and the data that they represent can be downloaded as PNG and JPEG files for printing. MapStory is a free tool for creating mapped displays of data sets. Data sets that are time based, the travels of Genghis Khan for example, can be set to play out in a timeline style on your map. Creating a MapStory might look complicated at first glance, but it's actually quite easy to create a map. To get started select a data set or sets that you want to display on your map. You can choose data sets from the MapStory gallery or upload your own. The notes option in MapStory lets you create individual events to add to your map and timeline. Lines and polygons can also be added to your projects through the notes feature in MapStory. Timelapse is an incredible visual satellite timeline powered by Google. Timelapse is about as close as you can get to a time machine, if that time machine hovered above the earth and gave you a bird’s eye view of development and change. Students can choose from some highlighted Timelapse views including: Las Vegas, Dubai, Shanghai, Oil Sands, Mendenhall Glacier, Wyoming Coal, Columbia Glacier, and Lake Urmia. Alternatively, students can use the search box to view a satellite timelapse of any place in the world. Students can change the speed of the timelapse, pause the satellite imagery, and zoom in or zoom out. The imagery begins in 1984 and goes through 2012. Timelapse The site itself sparks lots of questions. Depending on the location, students may inquire into climate change, history, development, expansion, human impact on land, satellites, etc. Timelapse could also be used in science classes and history classes. This is a great tool for students to use to analyze and evaluate visual data. Google Data Explorer ​The Google Public Data Explorer makes large datasets easy to explore, visualize and communicate. As the charts and maps animate over time, the changes in the world become easier to understand. You don't have to be a data expert to navigate between different views, make your own comparisons, and share your findings. If it Were My Home is a country comparison tool where students can compare living conditions in their own country to those of another. StatWorld could be a good tool to have students use to compare the economic development of countries and regions. Have students compare data sets from multiple categories and ask them to try to develop cause and effect relationships between the data sets. For example, can they find a connection between the duration of compulsory education and GDP per capita? Google Maps Mania Terrific site for finding maps that zero in on economic and political issues, e.g., states and countries poverty levels or worldwide slavery. Animaps is a service that was built for the purpose of allowing users to create animated Google Maps. The basics of creating maps in Animaps is very similar the process for creating maps in Google Maps. The main benefit of using Animaps over Google Maps is that you can create a tour of your placemarks that plays through according to the timing that you specify. Another benefit is that you can build in colored shapes to expand and contract to demonstrate patterns. You can also import images to your map from Flickr, Picassa, and Facebook. Target Map is a service that allows anyone to create mapped displays of data sets. Users of Target Map can importa and map their own data sets, use data sets from other users, use data sets found online, or manually input data onto a map. ikiMap is a free service for creating custom maps online. The service allows you to build custom maps on top of Google Maps, Bing Maps, and Open Street Maps. You can also use a completely blank canvas and upload a map. The maps that you create on ikiMap can be shared publicly or privately. Your maps can be constructed collaboratively on ikiMap. To create a custom map on ikiMap you do have to register on the site and confirm your registration in an email. Each placemark you add can contain text, images, links, and embedded videos. ikiMap provides easy-to-use tools for drawing shapes. Upload feature to import data sets and KML files. You can download your maps from ikiMap as KML files to use in other applications. An online alternative to Google Maps that offers a little more in terms of customization features. Knoema is a huge collection of data sets and maps for public use. Knoema offers data maps and charts for almost every country in the world. There are dozens of data categories to pick from. Some of the data categories that you will find include GPD Per Capita, Government Debt, Migration, Housing, Energy Consumption, and Agricultural Production. To find a data map or chart on Knoema to use with your students first select a data set then choose a country from the drop-down menu tied to each data set. Each data set, map, and chart can be exported downloaded and or embedded into a blog post or webpage. What About Me? is a free infographic generator from Intel. The purpose of What About Me? is to create infographics based on your Facebook, Twitter, and YouTube activities. The infographic created includes parts of your recent Facebook posts, when and what you post about on all three networks, and What About Me? even evaluates the average tone of your messages (mine are neither angry nor overly happy in tone). When your infographic is complete, you can download it from What About Me? It could be a good tool for getting students to look at their social media footprints. This could be particularly important for high school students applying to college as well as for students looking for jobs. A collection of world maps. where territories are re-sized on each map according to the subject of interest. There are nearly 600 maps. Maps 1- 366 are also available as PDF posters World Mapper offers a unique way to look at data sets. World Mapper hosts a large collection of over maps displaying all types of scientific, economic, historical, and demographic data. World Mapper uses density-equalizing maps to display each country and continent differently based on each data set. For example the birthrate map displays countries with a higher birthrates as larger than normal (standard projection) when compared to countries with a lower birthrate which displayed smaller than normal. World Mapper makes hundreds of the maps available PDF files that can be used to create posters for your classroom (click here for a land area map). World Mapper also makes available, as pdf files, the data sets used in the creation of each map. Flare Website Flare is an ActionScript library for creating visualizations that run in the Adobe Flash Player. From basic charts and graphs to complex interactive graphics, the toolkit supports data management, visual encoding, animation, and interaction techniques. UUorld - AMAZING! Immersive mapping environment, high-quality data, and critical analysis tools. Explain the world in maps. Depict data geographically and over time. WATCH the intro. video at the site. Vidmap, lets users create maps that work in tandem with online video, displaying the location that appears in the video on an adjacent dynamic map. The process to create a map is surprisingly easy: upload a video to Vidmap or use one already hosted on YouTube and click the map to create drag and drop markers. The result is a map that has an added layer of dimensionality and visual interest. UMapper Quickly create, edit and annotate maps with this web based tool. Mapping services to choose from include: Bing, Google, Yahoo and Openstreet. Maps can be tagged, routes created, and media embedded within the map (audio & image). Once a map is complete it can be shared or embedded. IMF's Data Mapper If you're in need of a good visual representation of the World's economic outlook, check out the IMF's Data Mapper. The IMF Data Mapper allows you to see the current, past, and predicted distribution of wealth around the world. Use the slider tabs on the IMF Data Mapper to change the map's display. Scribble Maps Edit and make notations on Google Maps with this web based mapping tool. Features include: text, image & markers. Final product can be saved and shared with an embed code. MapTiler This a tool that allows users to create overlay of standard maps like Google Maps, and Yahoo Maps and can also be visualized in 3D form. Build A Map This is another cool tool for teachers to create maps. Build A Map is powered by Google Maps and provides a wide range of tools to easily build interactive online maps. World Map This one here is being developed by Center for Geographic Analysis at Harvard University and allows users to easily build their own mapping portal and publish it to the world or to just a few collaborators. Map Faire This is a cool tool for teachers to create awesome maps and share them with their students. Map Faire has a simple and student friendly interface and is very easy to use. If It Were My Home A Google Map tool that allows you to compare the size of the BP Oil Spill to your community. If It Were My HomeIf It Were My Home will also show you a size comparison of a selected country centered over your hometown. now offers a feature for quickly comparing ten key statistics about life in different countries. To view the comparisons just select two countries from the lists and click compare. Animaps Animaps extends the My Maps feature of Google Maps by letting you create maps with markers that move, images and text that pop up on cue, and lines and shapes that change over time. Target Map is a new service that allows anyone to create mapped displays of data sets. Users of Target Map can importa and map their own data sets, use data sets from other users, use data sets found online, or manually input data onto a map. Better World Flux allows users to create animated visualizations of development data. To use Better World Flux (no registration required) all you have to do is select a data set from the menu provided and select a country or countries from the menu provided. From there Better World Flux creates an animated data visualization for you. The visualization will change as the years on the timeline at the bottom of the visualization change. This way users can see growth and recession of a statistic over time. Social Explorer provides easy access to census demographics about the United States from 1940 to 2000. The free public edition offers a collection of interactive demographic maps of census data that can be viewed, queried, and manipulated. Students can visually analyze and understand the demography of the U.S., their regions, and their neighborhoods, creating their own queries and parameters. Tools include zoom-in capability, selection of variables, the option to create a slideshow enabling comparative dataset mapping, and printing. Storify It is an application that allows users to create engaging stories out of tweets . You can also create stories using social media and turn what people post on social media into compelling stories . Map a List is a free tool that you can use to turn Google Spreadsheet information into Google Maps placemarks. To create a map from your spreadsheets you need to register for a Map a List account and give it access to your Google Docs account. Map a List then walks you through each step of selecting a spreadsheet, defining the parameters for your map, and choosing placemarks. Within Google Spreadsheets there are many "Gadgets" that can be used to create visualizations of data. To explore the gadgets that will work with your data, go to the "insert" drop-down menu then select "gadgets." GeoCommons provides excellent tools for creating and sharing map-based data visualizations. Users can select a from twelve base maps to build upon. After choosing a base map users can select from more than 49,000 public data sets or upload their own data sets. Map creators can add more than one data set to their maps. Visual Ranking Tool by Intel The Visual Ranking Tool makes the process of ranking items and comparing lists easy. With a simple click and drag, students move items to any position in a list. Working in teams, they collaborate and negotiate their reasoning. The comment feature of the tool gives them a place to record this rationale. Seeing Reason Tool by Intel With the Seeing Reason Tool students create visual maps of the factors and relationships in a cause-and-effect investigation. City Data is a free directory of statistics about US Cities. The type of data sets that you will find on City Data includes all the typical information you'd expect to find like housing prices, demographic data, and job data. City Data also provides information about things like cell phone coverage, quality and availability of public transportation, and air quality. The data is arranged in list form, in graph, and chart form. Beyond the statistics available on City Data, all of which you could find on other websites, there is a great discussion board. Exhibit 2.0 Exhibit lets you easily create web pages with advanced text search and filtering functionalities, with interactive maps, timelines, and other visualizations. No need for complex database and server-side technologies. Showing Evidence Tool by Intel The tool provides a visual framework to make claims, identify evidence, evaluate the quality of that evidence, explain how the evidence supports or weakens claims, and reach conclusions based on the evidence. GeoCommons Maker! "Professional cartography is now in your hands. Maker! was designed by cartographers with an eye for detail. Style your map with shaded thematics, proportional symbols, and more. Maker! makes the tough statistical and cartographic decisions for you. Anyone can build complex, data-rich maps." Ushahidi is a nonprofit, open-source software company that develops a Web platform that makes it easy for people in any part of the world to disseminate and collect information about a crisis. Users can submit reports by text message, e-mail, or Web postings, and the software aggregates and organizes the data into a map or timeline. In addition to its crisis-mapping software, the company has also launched a product called Swift River that uses machine-learning algorithms to extract and organize accurate information from the flood of e-mails, text messages, blog posts, and tweets that can seem overwhelming in the first days of a crisis. Visual Schedules - best for younger students. Inkscape is a free vector graphic software available for many platforms. This is the ideal free option for the creation of your overall infographic. Simple and intuitive, you should have no problems importing your visualizations and combining them with other visuals to create your masterpiece. aiSee reads a textual graph specification and automatically calculates a customizable graph layout. This layout is then displayed, and can be interactively explored, printed and exported to various graphic formats. "Infographic thinking" doesn’t let designers to interpret a narrative visually; it lets them invite the viewer [to] join in the process of interpretation, too. It’s what makes infographic design a language, not a formula or a fad. eLearning Infographics is an excellent site for finding educational infographics. Not only can a user search for infographics in a wide range of topics a person can submit their infographics as well. Once a user finds their infographic, they can print it out, share it w/ others, or even embed it into their site/blog. Visual.ly is a website that catalogs infographics from across the web. Visual.ly has more than 5,000 infographics arranged in twenty-one categories. One thing to keep in mind, I probably wouldn't send students to site on their own because there are some infographics that are not appropriate for public school settings. And if you find an infographic that you want to embed into your blog or website, try using Zoom.it to make it fit correctly in your display area. Visualizing.org is a community site for sharing data visualizations (infographics). Anyone can upload their data visualizations to the public gallery. The public gallery is divided into four categories; economy, environment, health, and energy. Visualizations in the gallery can be downloaded, printed, and or embedded into your blog or website. Google Images - Do a search on Google Images for a topic, e.g., "pollution infographic"
Mapping America: Every City, Every Block which presents United States Census data from 2005 to 2009. The American Family Through Time is an infographic produced by Archives.com The infographic laid out in a board game style. Every set of U.S. census data is available on the board. Click on any of the years to pop-up some highlights from that census. is an informative infographic that I found on Cool Infographics. The infographic has six screens that you can move through to find poverty statistics divided by race, gender, education, age, and family type. Each screen allows you to drill-down to more refined statistics. You can look at statistics by year from 1967 through 2010. Surging Seas is an interactive map of the potential impact on the United States of rising sea levels. The map allows you to click along coastal areas on the east coast and west coast to see how high the sea level could rise. The Surging Seas maps also project the number of people, homes, and land area that could be affected if the projections are correct. Visual Economics is a provider of articles and infographics about various economics-related topics. Yesterday, I came across an infographic they produced titled How Wealthy Countries Tax Their Citizens. The infographic depicts how the world's 29 wealthiest countries tax their citizens and how that money is spent. Some of the other infographics from Visual Economics are Timeline of the New Healthcare Bill, US Trade Bans Across the Globe, and A Detailed Look at TARP. UN Environmental Fact Sheets, Posters, and Infographics series of free posters based on data from the UNEP's Geo Data Portal. These posters visually and graphically display information about environmental data. Some of the topics covered in these posters include electricity production and consumption, CO2 emissions, ecosystems management, and hazardous materials. Each fact sheet, poster, and infographic is available as a PDF that you can download and print. Mapped visualizations of data sets. Some of the more interesting maps illustrate correlations between climate zone and population density. All of the maps can be downloaded and printed for free use in your classroom. The data sets behind the maps are also freely available for classroom use. The Scale of the Universe 2 features a huge selection of objects in the universe that are arranged according to size and scale. You can zoom-in on the image to objects as small as neutrinos and quarks or as large as planets, constellations, and galaxies. When you click on an object in The Scale of the Universe 2 a small window of information about that object pops up. Magnifying the Universe. Magnifying the Universe allows you to see the size of atoms, animals, buildings, mountains, planets, stars, and galaxies in relation to other objects in the universe. Try it out as embedded below. Newsmap Newsmap is an application that visually reflects the constantly changing landscape of the Google News news aggregator. The Psychology of Color is an infographic from Painters of Louisville. This simple infographic explain the feelings that people have in response to certain colors. The infographic also gives some examples of colors used in the marketing efforts of well-known brands and why those colors are used. INFOGRAPHIC : Always Connected - A Day In The Digital Life Whether we like to admit it or not, we're addicted to our gadgets and to the Internet. This cool infographic show just how. INFOGRAPHIC : Software Piracy - The Untold Tales For every person who buys something legally, there are probably 10 who are taking the risk of stealing it. The story behind illegal downloads. How Animals See the World is a nice infographic published by Mezzmer (a retailer of eyewear). The infographic offers some simple explanations of how sharks, insects, lobsters, horses, mice, and common household pets see the world. With the drama and urgency of a sportscaster, statistics guru Hans Rosling debunks myths about the so-called "developing world. <-- MIT SENSEable City Lab, which explores the "real-time city" by studying the way sensors and electronics relate to the built environment. Watch some examples of dynamic infographics controlled by live sensors.